These are the bags we used on Bread Matters courses to cover a proving basket or tin whilst the bread is rising in it. We stock two sizes: 30cm x 45cm (for covering a small tin or proving basket) and 38cm x 50cm (for covering a large tin or a 1kg or larger proving basket). Both are available in packs of ten. We use as little plastic as possible at Bread Matters. 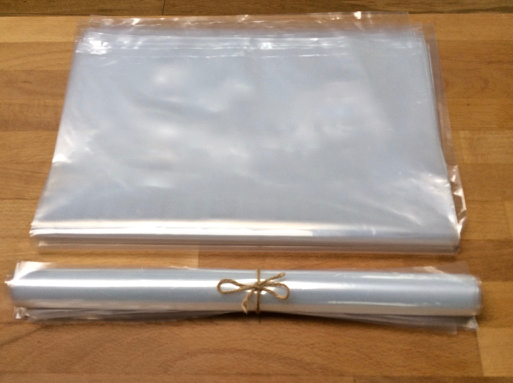 We have replaced plastic food wrapping with biodegradable, plant-based film, waxed brown paper and Bee Bee Wraps. The packaging for our Original Bread Matters Sourdough Starter is all biodegradable. We use organic cotton bags and re-use good old cardboard boxes to carry our own shopping in. 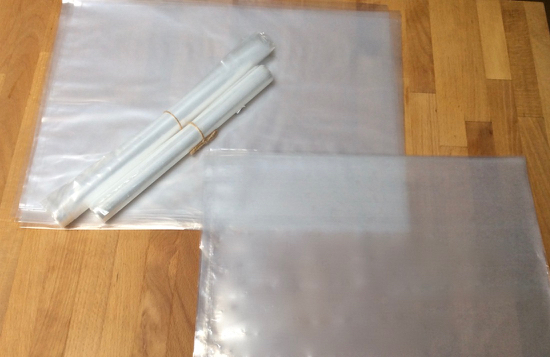 However, there is one job in the baking studio that we still use polythene bags for. We just have not found a substitute for a clean plastic bag to cover a proving basket or tin full of rising dough. It is hygienic, you can trap a little air above the dough to create a space for it to rise into, it retains the moisture and stops the top of the loaf from drying and cracking. We started to sell these because so many course participants wanted to take some home with them. You can re-use and wash them many times, so a pack of ten in each size may be all you’ll ever need.